Remember how in 2006 Chavez said at the UN that Pres. Bush smelled of sulfur? Can’t say I expected otherwise, even with all that Bill Ayers-Chavista looove. His refutation of the “terrorist” charge relies, ironically, on the U.S. government’s definition: “premeditated, politically motivated violence perpetrated against non-combatant targets by subnational groups or clandestine agents.” “We did not do that,” Ayers insisted. Ayers has been singing this tune for years. In a 1976 tract, he called for “revolutionary violence,” as long as it was “humane.” By then the war was over, and his goal was “to build communist organization toward the stage where armed struggle becomes a mass phenomenon led by a Marxist-Leninist party: a revolutionary stage.” His crazy means were dictating even crazier ends. The rehabilitation of William Ayers, the ’60s terrorist who wishes he’d done more, reflects one of the most fundamental shifts in American culture toward relativism and the rejection of moral truth. If you want to buy Ayer’s book, fine by me – it’s a free country and you can buy what you best please – but I won’t be linking to it. to ayers; v., to expose someone as a self-aggrandizing obfuscatory euphemist in matters pertaining to that person’s own past. The Weather Underground was a subnational group; exploding bombs is an act of violence; government offices are non-combatant targets (the Weather Underground also bombed banks); and the use of violence had the political goal of ending the Vietnam War. “Screaming response” or no, this was terrorism. Under current law, Ayers was a terrorist. This definition is not idiosyncratic; similar definitions can be found in the laws of foreign countries and in international treaties. 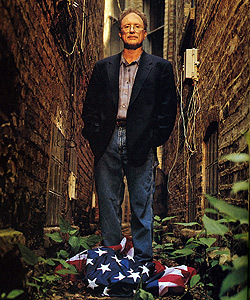 Ayers seems to think he ought to be excused for violence because his motives were good, but that is the excuse that terrorists always offer—that their political goals justify their use of violence—and naturally the legal definition could not permit such a defense without subverting itself, or turning every terrorism trial into a debate about whether the political ends of the defendants are “good” or “bad” from a moral or political perspective. As a good capitalist, William Ayers is re-relasing his book and going on book signings. Ayers new apologia is, as one reads it, completely amazing in his disingenuous argument. He was active, he writes, at “a time when the world was in flames, revolution was in the air, and the serial assassinations of black leaders disrupted our utopian dreams.” Let us look at the last claim. Was he eluding to Martin Luther King, Jr. as one of those black leaders? If so, all one has to do is recall that Ayers and company, who supported “black power” and not non-violent resistance to segregation, considered King an Uncle Tom, and regularly blasted him as a sell-out. As for the assassination of blacks, one of the offshoots of his own group killed a black policeman in the Brinks robbery, and another killed a black school superintendent in Oakland, California. And of course, the Weather Underground saw Huey Newton’s gang of thugs, The Black Panther Party, as the vanguard of the revolution, and declared their own support for their activities. Newton killed plenty of blacks who opposed him, as well as others in gang wars over drugs. You get the idea. Perhaps it had something to do with the photo he posed for tramping an American flag underfoot, his open espousal of the glories of bombing in his memoir, and his espousing revolutionary socialism as his goal in his two year old interview. Radosh doesn’t have to go back two years. Just a year ago Ayers was in Caracas pitching his revolutionary socialism and saying that he made a mistake in leaving political violence. 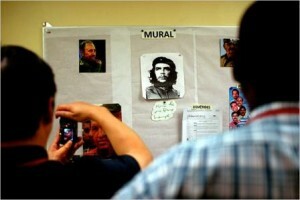 Will he [Ayers] condemn Chavez for silencing journalists and closing down opposition TV stations? “We had served together on the board of a foundation, knew one another as neighbors and family friends, held an initial fund-raiser at my house, where I’d made a small donation to his earliest political campaign,” he writes. Well, now he tell us. Venezuela Positions Itself as a Salon for the Left. this country’s equivalent to the Hotel Habana Libre in Cuba: a drab complex once associated with American power that serves as a symbol of revolutionary change. While at the Alba you can buy $147 souvenirs of Chávez, so your friends at home can build a little altar to him. Venezuela’s government also earns high marks from some foreign scholars for its creation of the Miranda International Center, a policy research outfit in a high-rise across the street from the Alba, and for prizes like the Liberator Prize for Critical Thinking. Franz J. Hinkelammert, a German-born theologian living in Costa Rica, was the first winner of the $150,000 prize in 2006. Marty Peretz of The New Republic (who coudln’t bother to look up the meaning of guayabera) calls Venezuala, Haven for Humanity’s Defenders. Just in time for the holidays, Jammie tells us the narcissist-Lenninist has a new CD out. The revelations, contained in a Newsweek history of the campaign, are likely to further damage Mrs Palin’s credentials as a future presidential candidate. “I’m worried,” Gregory Craig said to a NEWSWEEK reporter in mid-October. He was concerned that the frenzied atmosphere at the Palin rallies would encourage someone to do something violent toward Obama. He was not the only one in the Obama campaign thinking the unthinkable. The campaign was provided with reports from the Secret Service showing a sharp and very disturbing increase in threats to Obama in September and early October. Michelle was shaken by the vituperative crowds and the hot rhetoric from the GOP candidates. “Why would they try to make people hate us?” she asked Valerie Jarrett. Gregory Craig, by the way, was the attorney who represented Elian Gonzalez’s father during the Clinton administration’s disgraceful handling of the case. Except for the post hoc, ergo propter hoc fallacy, there is no reason to connect (a) Sarah Palin with (b) assassination threats against Obama. You’ve got Democratic operative Craig (whom we remember from the Clinton impeachment) who’s worried about the “atmosphere” at Palin rallies. Then you’ve got a post-Labor Day increase in threats against Obama. And . . . that’s it? That all death threats are made by subnormal mouth-breathers, I take as a given. (If you really want to assassinate somebody, you don’t make threats. Sirhan Sirhan — to whom Bill Ayers dedicated a book — didn’t make threats.) The only threat against Obama that actually led to arrests was made by a couple 0f teenage losers in Memphis, Tenn., a place where Sarah Palin never campaigned. There was nothing Sarah Palin said or did that was responsible for threats against Obama. If the threats spiked up after Labor Day, it was only because subnormal mouth-breathers don’t pay attention to elections until after Labor Day. Newsweek clearly is trying to peddle a disgusting smear by the Obama camp, and in the process take out a potential future rival. Tim Shipman merely makes explicit what Newsweek implied, but it’s like Oakland — there’s no “there” there. The Secret Service did not — repeat, did not — blame Sarah Palin for threats against Obama, and Shipman’s story is thus a lie. As a true conservative who knocked Obama off the headlines the day after the descended from the Invesco Field Olympus, Sarah Palin is a huge threat to many, and they’re set on destroying her chances at a political carreer. Expect a lot more of these attacks for the time being. That she remains a player and may be the party’s nominee in four years would make it smart politics for Republican staffers to praise her in print. But those who went on the record suggest that they were doing so out of genuine affection for Palin and a sense that the image of her coming out of the election — that of a self-absorbed conniver — was not indicative of the person they knew. I do find it ironic that the media who for years supported two of the most self-absorbed connivers – Bill and Hillary Clinton – are now finding fault with Palin. There are serious antiracist organizers building a revolutionary base in working class communities — in neighborhoods, shops, mills, mines, social institutions. There are those who are working among women, GI’s, vets, prisoners, among youth, students and the unemployed in every part of the country. There are some who have been at it for years and some who have just begun. Thousands more are needed; and each particular piece of work will have to be linked up into a whole. We need to out-organize the sophisticated and well-financed forces of George Meany, Louise Day Hicks, Ronald Reagan, George Wallace and Albert Shanker. Organizers need to crush this reactionary leadership with a revolutionized torrent of people. Erik has a new video, but before we get to that, the McCain campaign has finally insisted that the LA Times release a video where Obama, Ayers, and PLO supporters toast Edward Said’s successor, Rashid Khalidi — former mouthpiece for master terrorist Yasser Arafat – at a dinner sponsored by the Arab American Action Network (AAAN) in 2003. Given Obama’s (preposterous) claims that he didn’t know Ayers that well and was unfamiliar with Ayers’s views, why didn’t the Times report that Ayers and Dohrn were at the bash? Was it not worth mentioning the remarkable coincidence that both Obama and Ayers — the “education reform” allies who barely know each other … except to the extent they together doled out tens of millions of dollars to Leftist agitators, attacked the criminal justice system, and raved about each others books — just happen to be intimate friends of the same anti-American Israel-basher? Khalidi later lived near Obama while teaching at the University of Chicago. In 2001 a social service group whose board was headed by Mona Khalidi received a $40,000 grant from a local charity, the Woods Fund of Chicago, when Obama served on the fund’s board of directors. Michelle Obama attended a party several months ago celebrating the marriage of the Khalidis’ daughter. I list the above to make the point that Khalidi is not a simple casual acquaintance. The LA Time’s excuse for not releasing the tape? I can see why the LAT won’t reveal the name of its source, but why not release the tape? Is it perhaps that the source fears for their safety? The LAT has had no compunction in revealing a classified counterterrorism program, so why demur now? How damming can it be? Ayers is also not simply a casual acquaintance of the Obamas: Dig it! Via LGF, Zombietime reseached Barack Obama’s Close Encounter with the Weather Underground. Go read every word.